Week 1: Standard Tuning: drop picking and palm muting, triplets and left hand muting, alternate picking, chord variations, practice routines, getting a metal tone, four metal jam tracks. Week 2: Drop D Tuning: Pedal tone riffs, chord progressions and phrasing, alternate picking, palm muting, the phrygian dominant scale, technique performances, three metal jam tracks. Week 3: Drop C# Tuning: Arpeggiated riffs, odd rhythms over a 4/4 beat, alternate picking, palm muting, technique performances, two metal jam tracks. Week 4: E flat Tuning: Complete song breakdown with technique lessons focusing on triplets, pedal tones, down picking and palm muting, metal guitar jam track. Week 5: Drop C# Tuning: Complete song breakdown with technique including arpeggiated riffs, triplets, pedal tones, down picking, plus a metal guitar jam track. Week 6: Drop C Tuning: Complete song breakdown using alternate picking, palm muting, odd rhythms, phrygian dominant scale, plus a metal guitar jam track. Andy James is one of the UK’s rising stars of metal guitar. He’s lead guitarist with the band Sacred Mother Tongue. All of the jam tracks on this course have been specially devised by Andy to support your progress and help practice what you’ve learnt. Here’s Andy with a taster of the course. 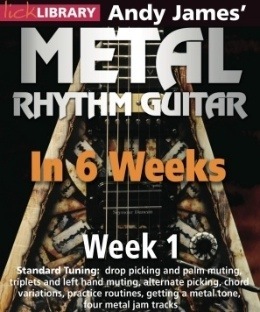 Check out Metal Rhythm Guitar in Six Weeks over at the Lick Library. A full set of DVDs will retail for UK£79.99 or you can buy each separately for UK£16.99.